When you stay at Wyndham Garden Lake Buena Vista Disney Springs® Resort Area in Lake Buena Vista, you'll be in a shopping district, within a 5-minute drive of Disney Springs® and Disney's Typhoon Lagoon Water Park. This family-friendly resort is 1.5 mi (2.4 km) from Disney's Lake Buena Vista Golf Course and 2.9 mi (4.7 km) from Orlando Vineland Premium Outlets. Make yourself at home in one of the 394 air-conditioned rooms featuring refrigerators and MP3 docking stations. Your pillowtop bed comes with premium bedding. Wireless Internet access (surcharge) keeps you connected, and cable programming is available for your entertainment. Private bathrooms with shower/tub combinations feature designer toiletries and hair dryers. Dip into one of the 2 outdoor swimming pools or enjoy other recreational amenities including outdoor tennis courts and a 24-hour fitness center. This resort also features complimentary wireless Internet access, concierge services, and an arcade/game room. If you're planning a day at a nearby theme park, you can hop on the complimentary shuttle. Enjoy American cuisine at Lakeview Restaurant, one of the resort's 3 restaurants, or stay in and take advantage of the room service (during limited hours). Snacks are also available at the coffee shop/café. Relax with a refreshing drink from the poolside bar or one of the 2 bars/lounges. Full breakfasts are available daily from 7:30 AM to 10:30 AM for a fee. Featured amenities include a 24-hour business center, complimentary newspapers in the lobby, and dry cleaning/laundry services. Planning an event in Lake Buena Vista? This resort has 19000 square feet (1765 square meters) of space consisting of conference space and meeting rooms. Self parking (subject to charges) is available onsite. 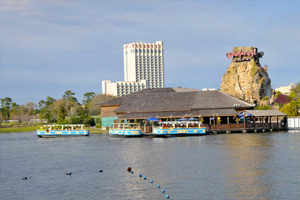 The preferred airport for Wyndham Garden Lake Buena Vista Disney Springs® Resort Area is Orlando, FL (MCO-Orlando Intl. ).